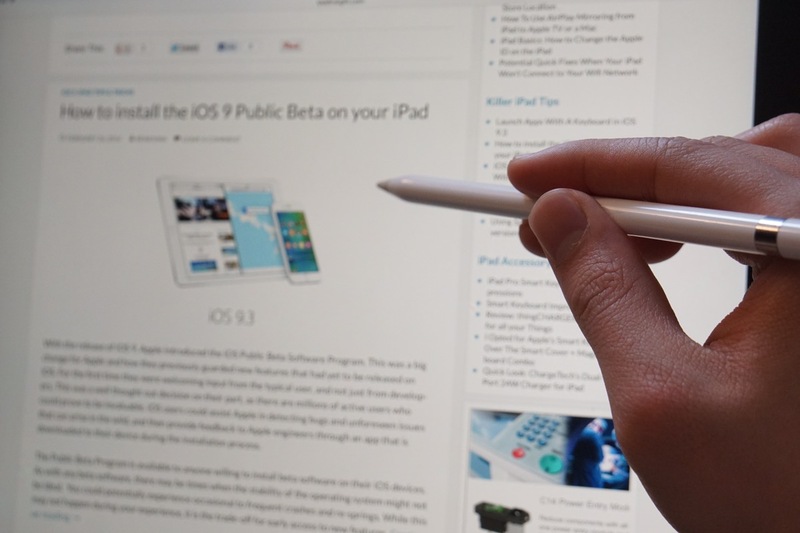 Before iOS 9.3, you were able to use the Apple Pencil on an iPad Pro in much the same way you would a finger. This is one of those things I didn’t think I really cared about until it was taken away from me in the past four betas. After all, before the introduction of the Pencil, I had always used my fingers to scroll and tap elements on iOS. The whole operating system is optimized to have the finger be the pointing device, and a stylus just didn’t seem necessary because the tap targets were always big enough. Now that I can once again scroll and tap anything with the Apple Pencil in iOS 9.3b5, I’m starting to get it. What I didn’t account for previously is how convenient it can be to browse while using the Pencil. My usual browsing habit when I’m using the iPad Pro at a desk is to keep my right hand clamping the bottom-right corner of the tablet. I keep it there because I scroll often while I’m browsing, and it’s a lot more comfortable over the long-term to scroll with one thumb than it is to use my index finger to flick at the middle of the screen. However, all of the controls within Safari on the iPad are located along the top of the screen. I don’t switch tabs with my thumb (for obvious reasons), so I use my index finger to point at the screen and tap them. Since the iPad Pro’s screen is so big (a good nine inches across), I often move my hand across the width of the screen to reach different tabs. The Pencil changes this interaction up because it can act like a much longer index finger. I can easily reach across the entire screen while keeping my elbow in a fixed position on the desk. In other words, I don’t need to lift my whole arm up to tap between different tabs. Scrolling on web pages is also simpler because I can flick with my entire wrist, instead of just the smaller arc afforded by my thumb. I’m not going to blow this out of proportion and say that this has changed the way I use my iPad Pro. It’s really just a more convenient option for browsing (which I do a lot of on my tablet), and I also make frequent use of keyboard shortcuts for loading sites and switching tabs. However, I did want to point it out to show that there are other ways of viewing a stylus than just for precision drawing or helping you to tap small on-screen targets. There’s also something to be said about having a stylus simply to have a longer pointing tool, especially as touch screens get bigger and bigger. I’d be curious to see what Apple could do with even more Pencil integration at the OS level. It may prove challenging to integrate 3D Touch on an iPad because of how hard you’d have to press (you might accidentally collapse a Smart Cover or topple the device), but I could definitely see some cool use cases for navigating the iPad with a Pencil and having iOS respond to pressure and unlock additional control.